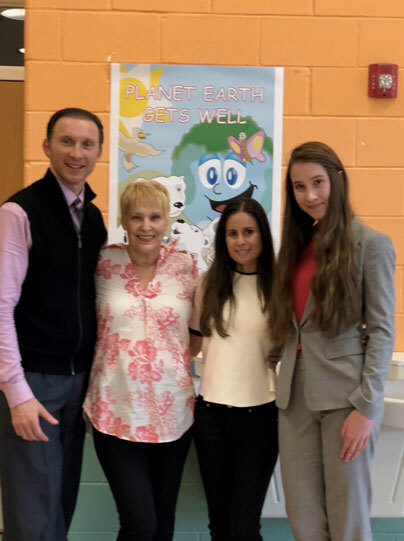 Earth Day celebration held on April 20, 2018 at the John Grieco Elementary School in Englewood, New Jersey. 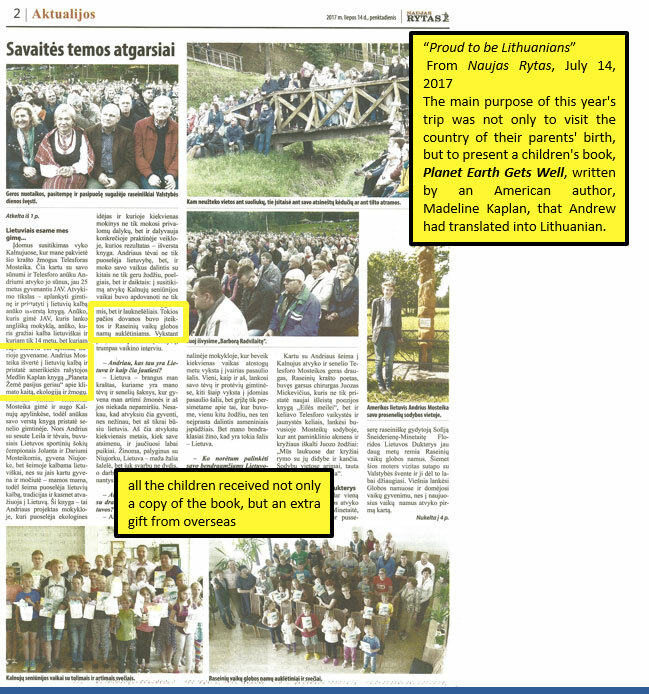 In collaboration with Englewood Family Center, author of the book, Madeline Kaplan and the Spanish translator Leila N. Mosteika shared the book with the children in their programs, encouraged their understanding through shared experiences, readings and drawings. 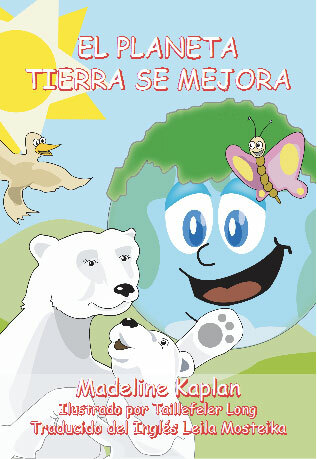 All the children received copies of the book (English or Spanish) to take home to their families. Translator Leila Mosteika with a poster of the book cover in Spanish. Author Madeline Kaplan and translator Leila Mosteika, Darius Mosteika and Nathalie Zapletal from the Bergen Family Center in Englewood, New Jersey. 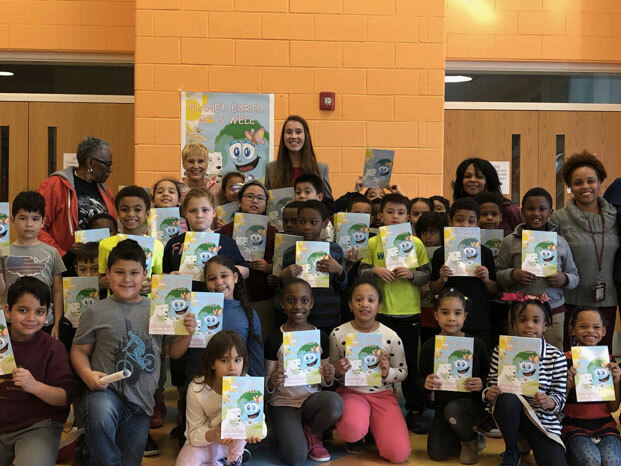 Author Madeline Kaplan and translator Leila Mosteika and the children of John Grieco Elementary School in Englewood, New Jersey. 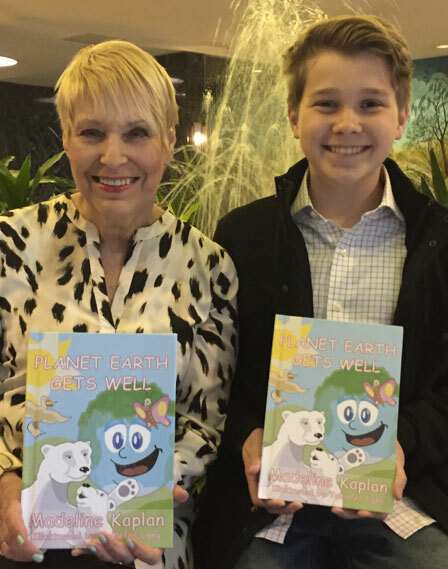 Author Madeline Kaplan with the children, drawing pictures inspired by Planet Earth Gets Well. 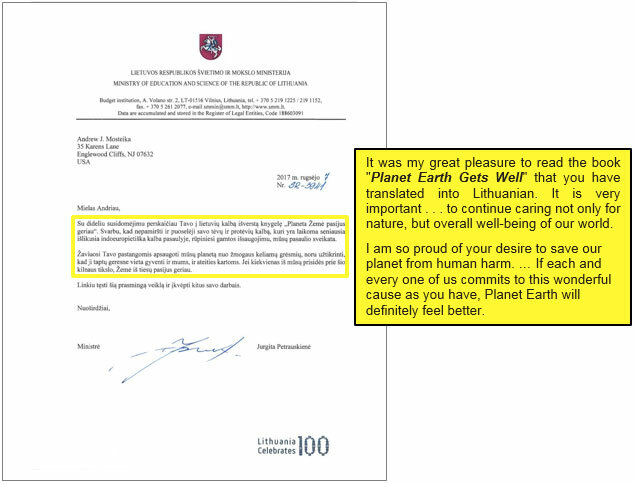 Leila Mosteika is a twelve-grade honors student at the Dwight-Englewood School in Englewood, New Jersey. Like most millennials, Leila also seeks to raise her generation's awareness of our fragile environment and the important role that everyone should play in saving it from climate change. 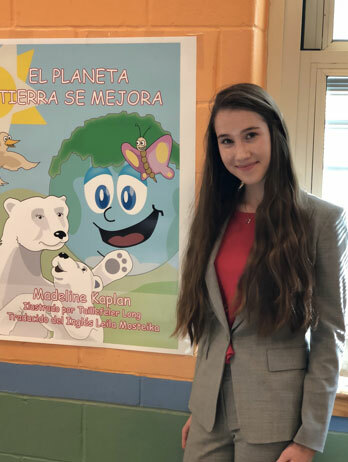 As part of her outreach efforts, Leila has translated Planet Earth Gets Well, by Madelaine Kaplan, into Spanish, to help expand the awareness of this important cause to the youth around the world. 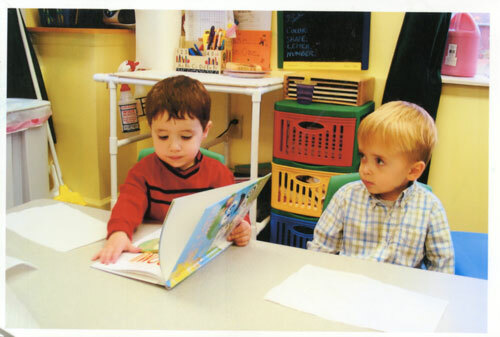 Andrew Mosteika is a tenth-grade honors student at the Dwight-Englewood School in Englewood, New Jersey. Growing up in a multi-lingual family and a very diverse community, Andrew is aware of the issues, challenges and social problems in today's constantly changing world. 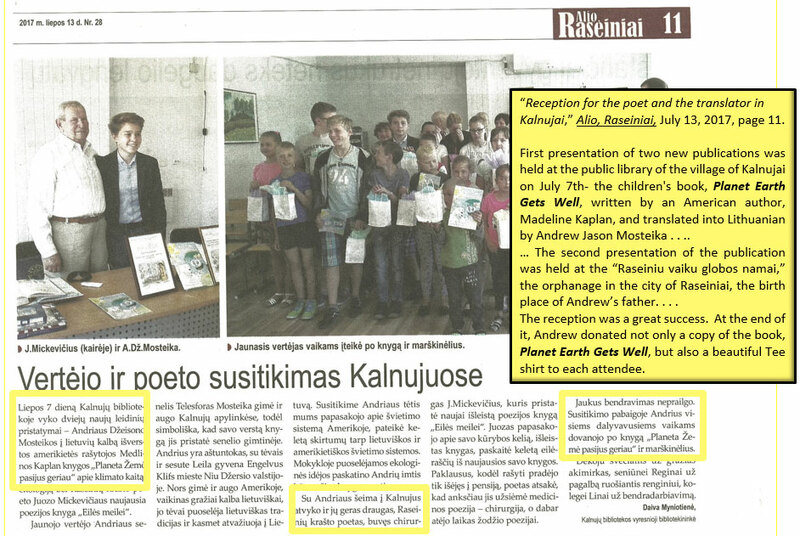 Following his sister's lead, he has translated two children's books into Lithuanian, Seven Nights of Santa, by Dwight A. Ensley and Carolyn J. Woodruff and Planet Earth Gets Well, by Madeline Kaplan. 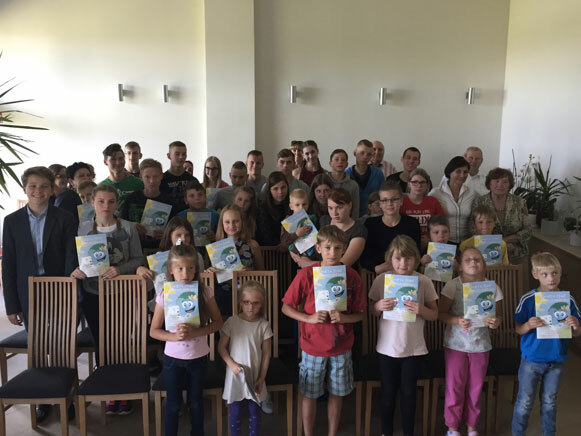 Translator Andrew Mosteika and the children of day care center in Kalnujai, Lithuania. 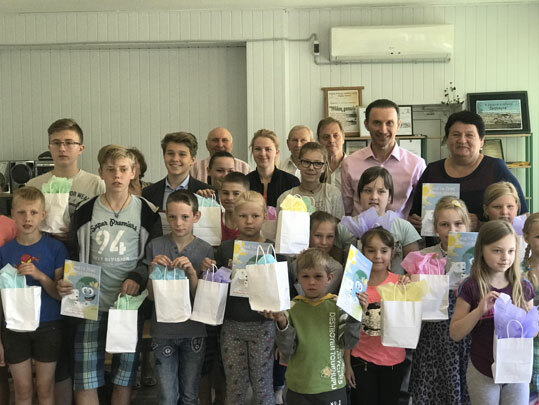 Translator Andrew Mosteika, the children and guests at the presentation at the orphanage â€œRaseiniu vaiku globos namaiâ€�, Lithuania. 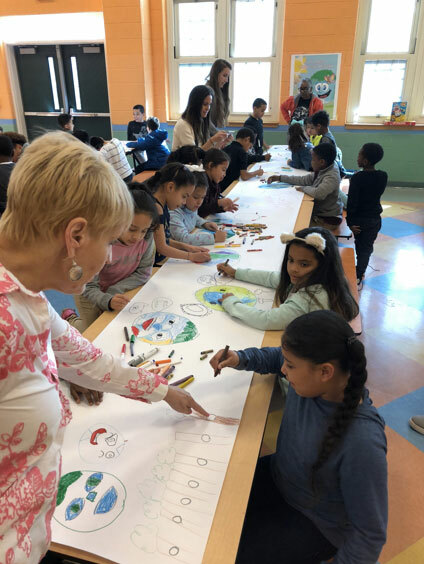 Earth Day Network held a back-to-school Student Climate Change Solutions Contest for K-4th graders inspired by the "think green for kids book," Planet Earth Gets Well by Madeline Kaplan. 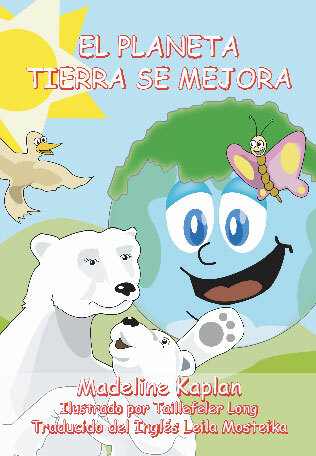 Please visit www.earthday.net/climatechangesolutionscontest to view First Place, Second Place and Honorable Mentions. Congratulations to the winners and thank you to all who submitted entries to our Student Climate Change Solutions poster contest. Webster Hill School is celebrating our love of reading with a very special Read Across America Day. Our reading guests include local authors, politicians, community members, Marines and news people. This is a day filled with reading adventures in every classroom. Fall Into Books Round-up and Giveaway! "... not since The Lorax by Dr. Seuss has a whimsically illustrated book come along aimed at sparking serious conversation with kids about the depleted environment they could inherit if each and every one of us don't continue to act." "....Since there is so little on the market for kids from age 4-8, I want them to be able to receive this very important message in a concept targeted specifically to them. 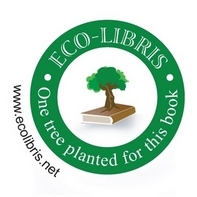 I am also looking at partnering with various environmental organizations by donating books so that they can use the story as part of their educational curriculum. 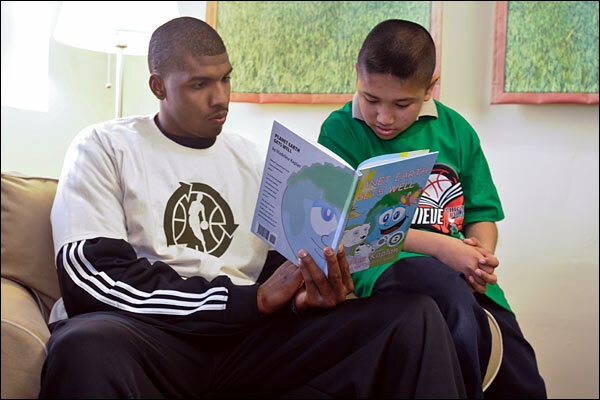 I want to do all I can to help these organizations get this big message out to the little ones." "Many of us think of Planet Earth in terms of Mother. Author Madeline Kaplan sees it as child. 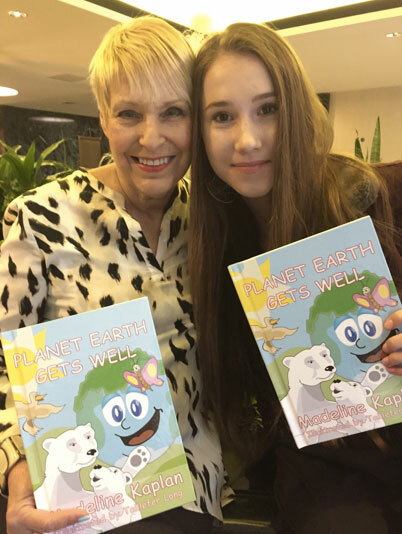 And this child feels sick in her new children's book 'Planet Earth Gets Well', which is our book today on Monday's green books series...."
"My earliest influences were my English teachers in HIgh School who encouraged me to express myself with the written word. Their faith in me provided an enormous psychic boost in my desire to keep on writing. I majored in English Literature in College and enjoyed reading the classics. A favorite was Milton's "Paradise Lost"." Discounted wholesale pricing for schools!